The Program, Seminar and Project Spotlight Committee plans and produces an annual calendar of high-quality luncheon programs, professional development seminars and project tours based on a diverse range of topics with interesting and accomplished speakers, which will be of value and interest to the CREW Boston membership. If you would like to contribute to our programming efforts and help shape our upcoming events, please join us. This Committee holds lunchtime planning sessions on a monthly basis and is always delighted to welcome newcomers. CREW Boston and the New England Chapter of the Counselors of Real Estate (CRE) gathered at the newly opened rooftop gardens and Conference Center at 53 State Street for a discussion on Multi-Family Housing. Moderated by Don Bouchard with Lincoln Property Company, panelist discussed the state of supply, demand, construction costs and the forecast for the multi-family market in Greater Boston. Panelists included Tom O’Brien, Founding Partner and Managing Director of HYM Investment Group and a former Director of the Boston Redevelopment Authority, Leslie Cohen, Principal, Chief Operating Officer of Samuel & Associates and Lauren O'Neil, Director of HFF. 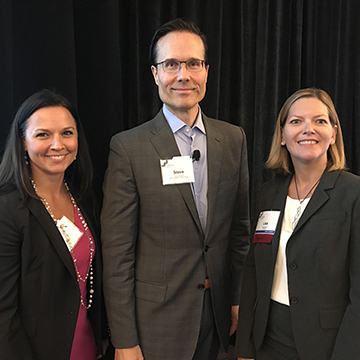 CREW Boston’s September luncheon featured Doug Poutasse of Bentall Kennedy, a Harvard-trained economic analyst and forecaster who shared his insights on mega trends in capital markets, the real estate industry and the overall economy. Overall, Poutasse said that the U.S. economy is poised for continued growth, with 2.5 million jobs created within the last year. However, consumers remain cautious and have decreased spending despite an increase in wages. Demographically, immigrants, baby boomers and millennials are key transformative forces in terms of labor markets, housing markets and consumption. The election does raise the risk of market uncertainty or policy changes but so far, the future looks bright. CREW Boston's June luncheon and annual meeting at the Boston Harbor Hotel featured Carla Harris, vice chairman of global wealth management, managing director and senior client advisor at Morgan Stanley. Carla, who is also the author of Strategize to Win and Expect to Win, inspired attendees with Carla’s Pearls, valuable lessons she’s learned through her successes and failures during a long career as a woman on Wall Street. Carla drove home the importance of not only surviving in the workplace, but thriving. She also provided key insight on how to get out of bad situations and achieve success despite any type of environment. CREW Boston's May luncheon at the Four Seasons featured John Barros, Boston’s first Chief of Economic Development. At this luncheon, CREW gathered a full house ready to hear about the opportunities, challenges, and future of development in Boston from the City’s perspective. John dove headfirst into the state of Boston’s economy as it stands. The numbers tell part of the story - Boston’s economy is thriving, growing 3.7% from 2012 to 2013, compared to the U.S. average of 2.2%. Also between 2012 and 2013, the city added 12,000 new jobs. But as John noted, to keep Boston growing sustainably, the City has to prioritize. In April, members and guests learned how to establish their competitive edge by creating a personal brand from Theresa Whiting, Executive Coach and Training Facilitator. During the seminar attendees were showed the history and importance of branding, introduced to techniques to create credibility statement and provide steps to communicate the message. Transportation is not what it is but what it does, Massachusetts Secretary of Transportation Stephanie Pollack told CREW’s March 2016 luncheon attendees on March 10. It shapes and supports the economies of communities and the region, and it connects people to opportunities. CREW Boston kicked off 2016 at the Hyatt Regency with a panel focused on the housing and growth policies that Massachusetts needs to implement in order to remain competitive as a state. Here are a few key takeaways from this panel, moderated by CREW Boston member Judy Jacobson, deputy director and general counsel at Massachusetts Housing Partnership (MHP). At November CREW Boston Lunchceon at the Hyatt Regency Boston, Kaminkow said retail is being built by both the old, bricks, and the new, clicks. But the big difference on the bricks side is that, with the universal availability of shopping by click, it now has to be not just a place to look and buy – but an experience. The dying old mall is being reinvented, she said, as a platform in the new age of superabundance, for the sophisticated consumer, based on research into how she/he shops. During the Commercial Real Estate Finance 101 Professional Development Seminar in November, Tod McGrath a Lecturer in the Department of Urban Studies and Planning (DUSP) at MIT and President of advisoRE, LLC walked attendees through financial jargon to help them better understand key terms used in today’s commercial real estate world. Seminar participants learned, among other topics, the meaning and calculation of present value and net present value, how to determine if cap rate is important, the definition of NOI (Net Operating Income), and the applicability of all these concepts to the buying and selling of assets.